A newsletter providing updates on events throughout the conference. Be sure to check weekly for updates. Proverbs 22: 6 admonishes us to train up a child in the way he should go and when he is old, he will not depart from it. This text encapsulates what we as teachers do at Bahamas Academy. Our approach to teaching and learning is directed towards building a holistic child who will be able to be a functional and productive citizen in The Bahamas, but more importantly, we are paving the way for a child who is ready to meet his or her Creator when He comes. According to Ellen G. White, from her book, Education, “Not only were the students taught the duty of prayer, but they were taught how to pray, how to approach their Creator, how to exercise faith in Him, and how to understand and obey the teachings of His Spirit.” This quote truly solidifies the necessity of devotions in setting the tone for the day. Our devotional exercises in the classrooms take various forms. Some of these include, having students share testimonies, prayer sessions conducted by the teachers as well as the students, and students who are scheduled to give devotional charges. During this time, students are given the opportunity to show how thankful they are for what God has done for them. It is very interesting to note that, as a result of these devotional exercises, many students have grown spiritually, and hearts were won for Christ in baptisms. In our classrooms, each lesson is carefully planned and designed to meet the needs and demands of our students. Our academic contents are combined with our faith through the Integration of the Faith and Learning approach. As customary, our lessons vividly reflect this component of instruction. For example, if I am facilitating the understanding of the Solar System in my Science class, which includes the planets, sun, asteroids, comets, moons or any other natural bodies that orbit the sun, students will also be given the opportunity of sharing the Creation story found in Genesis 1. The fact that God is the Creator of our solar system and the Universe will be reinforced. In this example, we can see where students are able to learn the concept of the Solar System while at the same time, developing a greater appreciation for God as our Creator. Additionally, through the Chaplaincy department, our students are engaged in a Week of Prayer and a day of prayer for each term. Through this effort, we have baptized 21 students to date for the 2018 -2019 school year. We are always mindful of the great Gospel Commission to teach and baptize souls for Christ’s kingdom. Furthermore, our Chaplain, Johny Davilmar, conducts Bible studies during the lunch periods so that students can be better informed about God’s words and the Seventh-day Adventist’s beliefs. Chaplaincy training is given to students in the high school. This is done to broaden the spiritual atmosphere of our school. Our mission statement at Bahamas Academy truly models our belief to empower students in a dynamic Christ-centered learning environment to develop character, acquire knowledge, and utilize skills for service to God and man. Dane Calvin, Grade 5 teacher, Bahamas Academy. 2019 Reaping Campaigns in ATCU: The prayer focus of The Atlantic Caribbean Union (ATCU) for the week, April 14 – April 20, 2019 is: Our Youth. There will be Bible study classes held on Sunday’s @ 7:00 PM at the Real Harvest Church beginning April 28. Initial subjects to be discussed this quarter include: The Sanctuary, Sabbath, Seal of God, State of the Dead, Spirit of Prophecy, Second Coming, Salvation. Future topics include: How to study a Biblical book (The book of Revelation will be used as a template), themes in the gospel of John and methods in using Bible software to maximize your study. Pastor Lynden Williams, Bible Studies Coordinator. SAVE THE DATE: Sunday May 19, 2019 - Sabbath School Lower Division Teachers Workshop. Learn innovative and practical ways to involve the children in your class. Revisit techniques to build attendance and support for this area of the CHAM department. Watch Here For Venue. The C.H.A.M Weekend Retreat will be held on June 7-9, 2019 at the Adventure Learning Center Camp Grounds under the theme “TREASURE HUNT... Finding all you need in Jesus”. It will be a time of fun, fellowship and spiritual enrichment for our children ages 7 – 14 years. Registration begins Monday April 15, 2019 to Wednesday May 15, 2019. For more information, call 341-4021 or enquire about details from your local leaders. Mrs. Lavern Sturrup, C.H.A.M Director. You are all invited to attend the 2019 Eight Weeks to Wellness graduation on Monday April 29th at 6.30p.m at the gym on the former Bahamas Academy campus, on Wulff Road. Fun/ Run/ Walk Easter Monday - April 21, 2019: A Fun/ Run/ Walk will be held starting at 6:30a.m. The route is Arawak Cay to Goodman's Bay and back for walkers. And runners will go to Melía and back. Fruits and water will be given to all participants. Also, a vegetarian breakfast will be available for a small donation. See any ASI executive member for tickets. For more information please call 323-0610 or email [email protected] -- Mrs. Nathelyn LaCroix, Health Director. Young men and boys 14 and over are welcomed to join the Adventist Men's Chorale. Please enquire about practice times with your local Men’s Ministries leader. Curtis Bryan, Men’s Ministries Coordinator. 13 – New Providence Women’s Ministries - Connect & Share, “God in Shoes” Community Outreach 5:30 p.m.
14 - Berea GEMS - Etiquette, Elegance & Grace Tea Party 4-6p.m Berea’s Fellowship Hall. Special Note: Anyone interested in traveling for the Family Island weekend events please call and give your name and contact to Ms. T’nee Moss at the South Bahamas Conference Office at 341-4021. Save the Date! Under the theme, “In Christ”, the Turks & Caicos Conference will be hosting the Atlantic Caribbean Union’s Retreat. This amazing retreat will convene at Beaches Turks & Caicos Resort & Spa in Turks & Caicos on November 1-3, 2019 with guest speaker, Janice Johnson-Browne. Kindly see your local leader for further details. Please also note that the registration deadline is August 31, 2019. --Mrs. Jacqueline Gibson, Women’s Ministries Director. S.O.A.R (Solutions to Obstacles Adventist Retreat) April 12-14, 2019. The Ministerial Department of South Bahamas Conference is hosting a special training program for all Church Leaders this weekend from April 12-14, 2019 at the National Training Agency on Gladstone Road. This gathering is designed to give all attendees the opportunity to participate in relevant workshops, share in meaningful discussions, and receive specific training in specific areas of service to the church. Special guest presenter for the plenary sessions will be Dr. Gordon Jones. Please pray for the outpouring of the Holy Spirit during these meetings. Pastor T. Basil Sturrup, Ministerial Director. All Sabbath School Secretaries are reminded to meet at the South Bahamas Conference office tomorrow Sunday April 14, 2019 at 9:15a.m. All are asked to be on time. –Pastor Leonardo Rahming, Director. 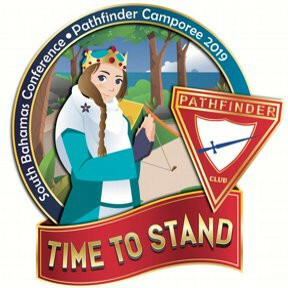 This Camporee is a spring board to the Atlantic Caribbean Union Camporee for 2020. REGISTER WITH YOUR LOCAL PATHFINDER CLUB DIRECTOR!!!!!! --Pastor Jamal Franklyn, Youth Director. The Bethany Seventh-day Adventist Church will be celebrating its 22nd Anniversary on April 13th, 2019, under the theme "Lest We Forget!". All interested parties are invited to attend. Those persons who are planning to travel to Cat Island for Homecoming, April 19 & 20, 2019 are asked to contact Elder Norman Seymour at 457-0067. April 20 -22, 2019: Kemp's Bay Seventh-day Adventist Church cordially invites you to its 5th Community Guest Day & Home Coming Events. On Sabbath April 20 @ 9:15a.m the guest speaker will be Elder Earl Thomas along with the New Providence Choir. Lunch will be provided. - Grand Concert April 20th @7p.m - An evening of music and drama. Fun in the Sun, Sunday April 21, 2019 @ 9a.m (Fun, games and fellowship for all). For more information contact Elder Trenton Durant at 474-0884. The Georgia Cumberland Academy Choir will be in concert at the Church at 6p.m on April 21st. All are invited to attend. The proceeds from the concert will go towards the completion of the New Living Faith Community Center on Old Trail Road. All are invited to enjoy this time of good music provided by the Georgia Cumberland Academy choir on Friday April 19, 2019 at 6:30p.m. The Family Life/Community Service Department invites you to their Annual Family Fun Day on Easter Monday April 22nd 2019 on the church grounds from 12 noon - 4 p.m.
Bouncing castle & games will be provided and some of your favorite snacks will be on sale. BRING THE ENTIRE FAMILY FOR A DAY OF FUN. Church Souse-Out & Fun/Run/Walk: Sunday May 5, 2019 at 6:30 a.m From BOL Church Grounds to Golden Gate Shopping Plaza and back. Souse-Out will be from 8 a.m.-1p.m. Dr. Shaneeta Johnson, MD, is pleased to offer a full-tuition scholarship for one student to attend Bahamas Academy of Seventh-day Adventists for Grades 10-12. The scholarship is competitive, academic and need-based. Students who are presently in Grade 9 from public or private schools may apply. Application forms are available at Bahamas Academy on Marshall Road, or the South Bahamas Conference of Seventh-day Adventists Tonique Williams Highway. Application deadline is April 30,th 2019. A cook out will be held to aid in the medical expenses of Ms. Sirilia Exalus on April 28, 2019. An assortment of dishes will be on sale. Serve some love by supporting our family. For further details, please call 446-628. --Ms. Benita Exalus. April 20, 2019 AT 7:34 P.M.